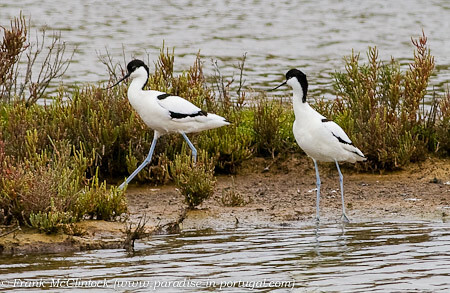 Avocets at Salgados-2868, originally uploaded by Paradise in Portugal. Our petition has passed the 2,000 mark already, so awareness is growing of the dire threat that faces Salgados. This awareness has begun hitting the headlines and various articles have been published already, such as those in the Algarve Daily News, (here), and The Resident, (here), and Birdwatch Magazine who have also written about it (here). Almargem has also complained officially to the EC; here’s a rough translation of it. There’s even been a Facebook page specially created. Meanwhile here at the Quinta Daniela and I are writing emails to hundreds of nature-based organisations and publications and all our friends and posting blog entries on our Birding site and Facebook page, so please join us in doing the same if you haven’t already – every little helps and we really are starting to make a difference! Salgado-3655, originally uploaded by Paradise in Portugal. 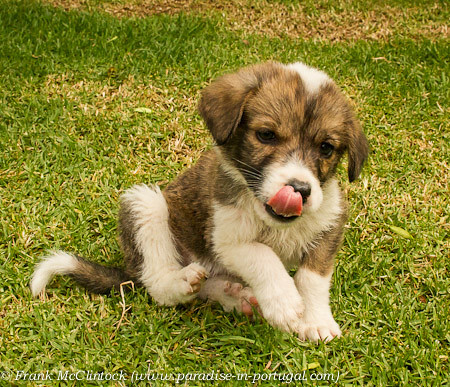 Readers of this blog might remember the sad demise of Sideways a few months ago, and ever since his passing Life here really hasn’t felt the same, especially for the rest of the crowd – Meiktila in particular was missing a friend – so the other day Daniela thought she’d surprise us all with a new puppy, and here he is. Then came the inevitable, “What shall we call him?” The children were predictably inventive, and when he started munching on water melon rinds the suggestion was “Tudo” as in “Come tudo” or “Eat anything”, but Daniela didn’t like that one. I of course wanted to continue the tradition of a battlefield name and fought hard, (but with not as much success as real life I’m afraid), for “Kohima” or “Kima” for short, but nobody else liked it. Finally, yesterday evening over dinner we had a brainwave … with the threat facing one of our favourite birding spots, Salgados, at the moment, we should call him Salgado – just in case we’re unsuccessful in this battle! At least we’ll have a name to remember the area we love now – and hope to continue to be able to do so for years to come too, so if you haven’t already signed our petition to save Salgados – or Péra Marsh as it’s sometimes known – please do so by clicking on the link attached and share on your Facebook page and Twitter as well. We started this petition 36 hours ago and are just shy of 1,000 signatures already so let’s all get aboard and save this unique and valued area – for us and our children just as much as for the birds, butterflies, dragonflies, moths and mammals for whom it is vital. The picture above was taken at a unique and Internationally recognized wetland Bird Sanctuary called Salgados. To Portugal’s shame, short-sighted politicians have just reached an “agreement” with a property developer currently facing corruption charges to destroy it entirely by building yet more unwanted hotels – as if the Algarve didn’t have enough already! I just created a new petition and I hope you can sign — it’s called: Save Salgados, a unique internationally recognized birding sanctuary, from being destroyed! This issue is very important to us all, and together we can do something about it! If you sign and then share with your friends and contacts, we’ll soon reach our goal of 40,000 signatures and build pressure to get this agreement rescinded. Great Spotted Woodpecker at nest with juvenile 3594, originally uploaded by Paradise in Portugal. A wonderful find down the Secret Valley a few days ago was this Great Spotted Woodpecker nest with nearly mature chicks. Spent a few hours down there now and managed to get this lovely shot.